The last competition match I shot almost cost me a holster. The day after the match I dumped out my range bag and was doing a quick inventory when I noticed: no kydex holster for the XD. That was bad, very bad. The holster set me back $80 and I really, really did not want to buy another one. I was headed back to the shop for a class that afternoon so I went early. I checked out the room where we hung out between stages and where I’d packed up my gear. The table was pristine and clean. My heart sunk. A couple was filling out forms, probably their first visit to the range. I was looking through every box and container around them when the gentleman asked, “Are you looking for something?”. I explained and he glanced into a large box on the floor next to him that contained VHS tapes and was labeled, “Free – Please take”. He said, “Is this want you are looking for?” The cynic in me thought he was messing with me, but hallelujah!. He picked up my holster and I gave him a huge grin. I told him he’d made me a very happy girl. I must have knocked it off the table when I was packing up. All gear labeled! Hopefully I won’t misplace anything again but if I do there is hope for it to be returned. Included: belt, ear muffs, custom ear plugs, 4 holsters, 3 mag pouches, glasses, and 3 sets of magazines. I also numbered the individual magazines. An instructor advised me to do that. Why? If you start having problems with a magazine you can tell if it’s always the same one or if it’s randoms (ie: an issue with the gun). And yes, I know using a label maker is kind of nerdy, but I really like the results. It will be interesting to see how the labels wear and if they stay attached to the gear. I have a small concern that the magazine labels will be scraped off when I load then stick in the magazine well, but that easy enough to fix. Each set has the labels in a different location so I can see what works best. 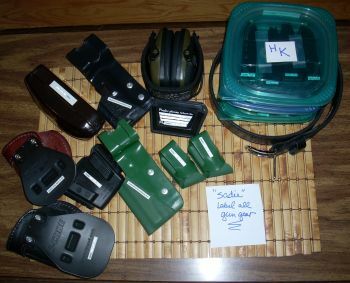 This entry was posted in Holsters, Magazines, Organization by Sadie. Bookmark the permalink.